In this video, we will discuss about drilling down and displaying hierarchical data in gridview controls. We will be using the following 3 database tables for this demo. 2. When a "Select" button is clicked against a continent, all the countries belonging to the selected continent should be displayed in another gridview. 3. Along the same lines, when a "Select" button is clicked against a country, all the cities belonging to the selected country should be displayed in another gridview. Use the following sql script to create and populate the required tables. Drag and drop 3 gridview controls and 3 Sqldatasource controls on webform1.aspx. 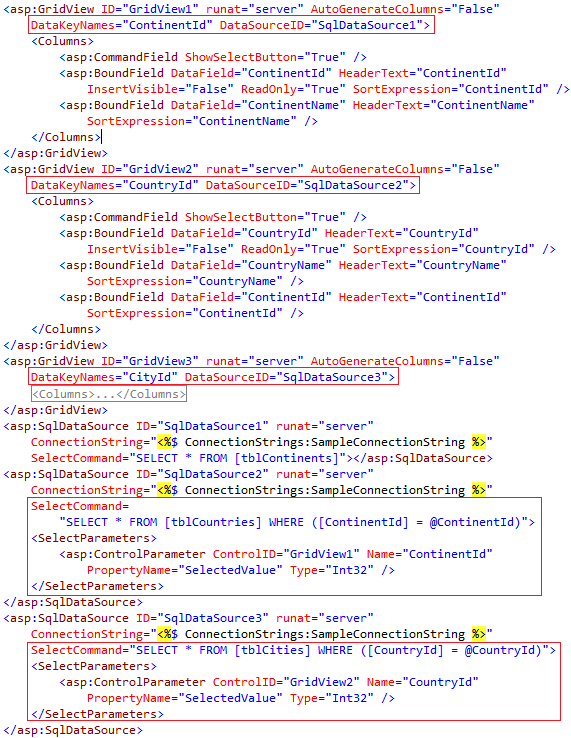 Step 1: Configure SqlDataSource1 control to retrieve data from tblContinents table. Step 2: Asscociate SqlDataSource1 control with Gridview1 control. Step 3: From GridView1 - GridView Tasks pane, please make sure "Enable selection" checkbox is checked. 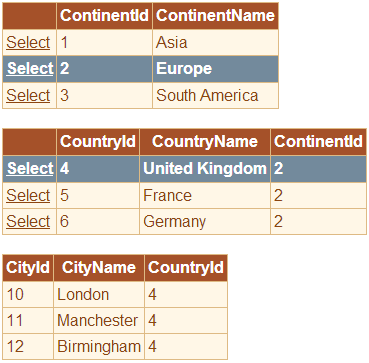 Step 4: Configure SqlDataSource2 control to retrieve data from tblCountries table. 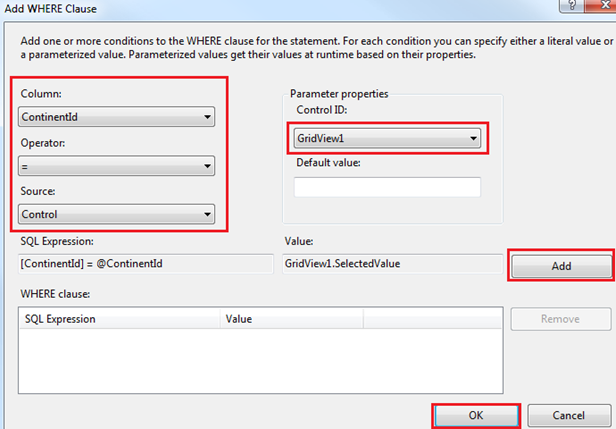 Configure the WHERE clause for the select statement, by clicking on "WHERE" button. ContinentId should come fromt the selected row in GridView1 control. Step 5: Asscociate SqlDataSource2 control with Gridview2 control. Step 6: From GridView2 - GridView Tasks pane, please make sure "Enable selection" checkbox is checked. Step 7: Configure SqlDataSource3 control to retrieve data from tblCities table. Configure the WHERE clause for the select statement, by clicking on "WHERE" button. CountryId should come fromt the selected row in GridView2 control. Step 8: Asscociate SqlDataSource3 control with Gridview3 control. 1. Values for DataKeyNames and DataSourceID properties of all the 3 gridview controls. 2. SelectCommand and SelectParameters of SqlDataSource2 and SqlDataSource3 controls. dGrid view is not loading on page load ..
iam using web page . when the page loads , no grid comes ? ?